Druid started doing so well after the ulcer medication; I decided to have another set of X-rays taken. I wanted to see what was going on inside the feet. Here are the X-rays from Dec. 22, 2003, just 6 months from the sinking. The sole is still very thick, but it is denser than it was in Sept. 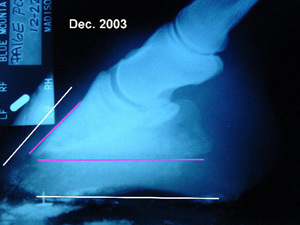 In the Sept. X-rays, the sole is very opaque, but in Dec. it looks more solid. Some people would say that he "de-rotated". I just feel that the hoof is growing properly around the coffin bone. When a horse "rotates" it just means the hoof wall isn't properly oriented around the bones. There is too much space between the toe and the coffin bone. Druid’s feet were starting to look more normal. OK, they were still really weird but much better than before. They were very tall, but since the soles were still soft, I thought he needed the extra height. I decided that his body knew more than my eyes. It was still hard for me know exactly how to trim his feet. There was no white line to follow and I did not want to invade live sole. At least he had heels at this point. The biggest plus was that he was comfortable. He was moving around and acting more and more like a normal horse. Return to the beginning of Druid's story. Druid's feet one month later. The second and third month of care. Four months after sole penetration, Druid is struggling. Five months into his care, Druid finally turns the corner. The X-rays taken at six months show huge improvements in Druid's feet. Seven months later, Druid has gotten comfortable on soft surfaces. The eighth month is when Druid's hooves really start to change. Nine months later, Druid goes home. In ten months, we ride Druid! Eleven months plus, Druid has a new career. 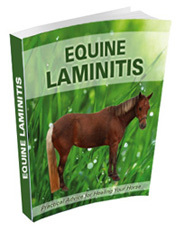 This ebook will teach you everything you need to know about laminitis plus give you practical ways to prevent, treat and manage the laminitic equine using safe and effective, natural methods.